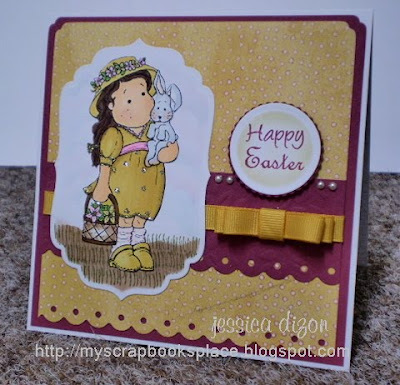 MY CRAFTS and STUFFS: SIMON SAYS EASTER OR SPRING and some GLIMMER! Happy Monday blogging world!!! Let's all thank God for another week and let's pray that He'll help us spend this week wisely and to direct us in using our talents for His glory! 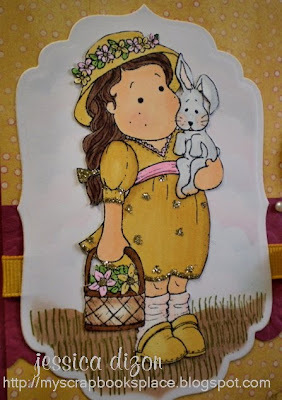 My card for today is my very first Easter card for this year. LOL!! Yeah, I'm late I know. I mean, I have an excuse 'coz I don't have any Easter themed stamp except from few RAK stamped images that I received from my online friends last year. In this photo, you can now clearly see my blue and pink sky! How do you like it? :) As I've said awhile ago, I don't have any Easter themed stamp which also means I don't have any sentiment that says "Happy Easter". So, I improvised on this one. I have this Technique Tuesday mini stamp (yes, it's Easter themed but it only has an egg, small flowers and the words Easter & Eggs). What I did, I looked on my stamps binder and searched for a word "happy" that will complement the the "Easter" word from TT. I tried and experimented and then BAM! Got the right combo! If you could only see the look on my face when I was mounting my sentiment up. So, so happy! :) I also did a faux bow on this card which also first for me. Thanks so much for looking and please let me know that you've been here by leaving a comment or two. I appreciate it, really!